« Just Set It and Forget It! I grew up watching a lot of black and white movies on television. Kids today might think there’s just something wrong with the television set when they see a movie or show that is actually in black and white. My parents both watched a lot of old movies, so I think I just grew up with an appreciation for them. I don’t think they are any better or worse than color movies, although I have to admit I think they movies that have been “colorized” mostly just look bad. The coloring just doesn’t seem right when you look at it. 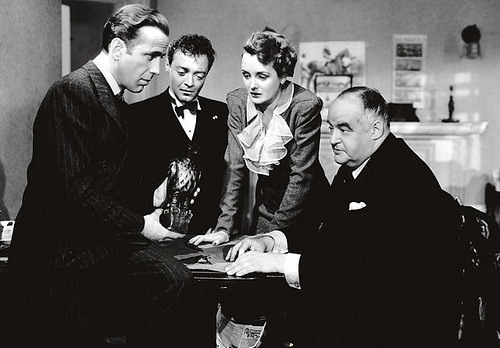 Anyway, there are quite a few movies from the past that I think are great, but my absolute favorite would have to be “The Maltese Falcon.” I’ve never read the Dashiell Hammett novel, and I don’t think I would want to at this point. I like the movie too much and it might not seem the same after that. All the characters in the movie seem to be played perfectly. Humphrey Bogart makes the perfect private eye, Mary Astor is the ideal femme fatale, and Peter Lorre and Sydney Greenstreet are great as eccentric criminals on a never-ending quest. When you watch it today, some of the dialogue might seem cliché since that type of crime story was done to death, but the lines are delivered perfectly. Bogart is Sam Spade; I am sure that’s how he’ll always be remembered by a lot of people, but he was so damn good at it, that I am sure it’s not a bad thing. The movie has an interesting storyline but I think it’s the characters who make the film. Sydney Greenstreet was great considering it was his first movie and he was 62 at the time. And of course there is the falcon itself, the center of the story (Michelle actually got me a replica for Christmas a few years back; it’s sitting on the mantle right now looking at me). Where else can you get to hear Humphrey Bogart recite a line from Shakespeare? Everything about this movie is great. If you have never seen in, give it a try. What do you do to stay positive in life? Everyone has good days and bad days. Sometimes it may feel like we have more bad than good, but I think everyone has something they do or consider or think about it that helps them get over the rough patches. There seems to be quite a number of people who manage to stay positive no matter what circumstances come up, so I would like to know what is that you do to keep smiling and getting through, good days or bad days? Think about it and let me know. You can answer on here, or on Facebook or on Twitter. I’ll also ask a few people on Twitter and see how they respond. I’ll post my answer tomorrow. Short post today since I really do have to get back to work quickly. I hope everyone is having a wonderful day and enjoying the summer so far. Have a great day and don’t forget to do something creative today! Tags: favorite black and white movie, question of the day, sydney greenstreet, the maltese falcon, what do you do to stay positive? I love black and white movies. Angels with Dirty Faces is my favorite. Thanks for checking out the blog. That one is also one of my favorites. I can remember seeing that one a few times!